Progressive Railroading reports that Utah Transit Authority officials announed that the Sugar House streetcar will begin service on December 8, 2013 a date that was met with a successful opening. 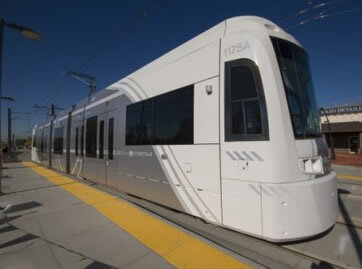 The line is designated the S line (for the Sugar House neighborhood, Salt Lake City, and South Salt Lake) and the cars will carry a white and silver livery tied to the city's industrial heritage. The Siemens S70 cars are essentially identical to the cars that operate in trains on TRAX light rail lines, but will run as single cars at speeds of 20 mph or less. The two-mile route is built along a former right-of-way. It connects Central Pointe on the TRAX line to Fairmont Park with five intermediate stops. The end-to-end journey time is 13 minutes. The line serves a total of seven stations on its route from the Sugar House shopping area to the TRAX station at Central Pointe.